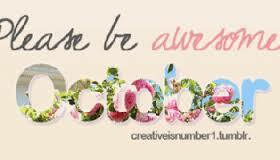 Hello October, we have a number of birthdays again this month starting with my baby sister Sandra on the 14th then there is dad's birthday on the 16th then we have a couple of weeks break before we have Sue on the 28th and then Dave my baby brother on the 31st. Last month my mum signed up for Facebook, yes mum is now on Facebook via her phone my sister Sandra signed her up and mum has told me she is so happy that she did as mum has mentioned a few times to me that she has seen this or that on Facebook. School goes back next Tuesday for the last school term of the year, school will break up around the 18th December this year. This weekend is a long weekend with Monday being Labour Day here in New South this is the day we have to mark the eight-hour working day for Australians, it also recognises workers' contributions towards the nations economy. It is an annual public holiday and its date varies across the states and territories. It is also the last long weekend of the year. Of course I will be having Blain most nights starting from Tuesday night again this term with his mum still working at night as a cleaner. She would really like to find day time work as she is finding night work exhausting and she misses seeing Blain as she only sees him for half an hour or so each morning and this is also upsetting for Blain as well. Leo is still suffering from jealousy with me having Blain so often but it isn't something I can do anything about, also I don't get to see my granddaughters as often as I see Blain but this is just the way it is at this time, things change all the time. I have started getting Christmas presents online as I do every year, in fact I start Christmas shopping on Boxing day if not earlier. I love to give and it annoys me that Tim doesn't get that I am a giver. Oh yeah I know that October is when some parts of the world celebrate Halloween and yes I know there are some in Australia who celebrate it but not me nor my family as for us it is not an Australian thing. Ok that is all for this month, not much is happening at this month.